Simply typed term rewriting proposed by Yamada (RTA, 2001) is a framework of higher-order term rewriting without bound variables. 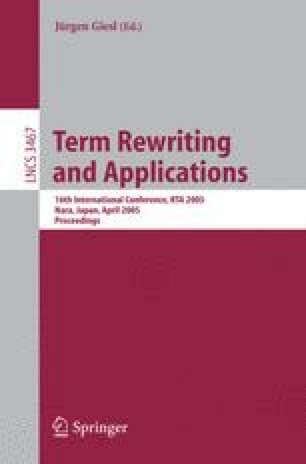 In this paper, the dependency pair method of first-order term rewriting introduced by Arts and Giesl (TCS, 2000) is extended in order to show termination of simply typed term rewriting systems. Basic concepts such as dependency pairs and estimated dependency graph in the simply typed term rewriting framework are clarified. The subterm criterion introduced by Hirokawa and Middeldorp (RTA, 2004) is successfully extended to the case where terms of function type are allowed. Finally, an experimental result for a collection of simply typed term rewriting systems is presented. Our method is compared with the direct application of the first-order dependency pair method to a first-order encoding of simply typed term rewriting systems.